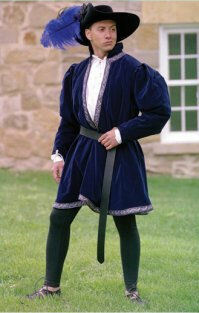 An early Tudor style, the long doublet was popularized by King Philip the Good in the early 15th century. Though the original is lined and trimmed in fur, we've used a regal jacquard trim and a satin lining to make the doublet wearable even on warm faire days. Made of 100% cotton velveteen with jacquard trims and an assorted contrasting satin lining.